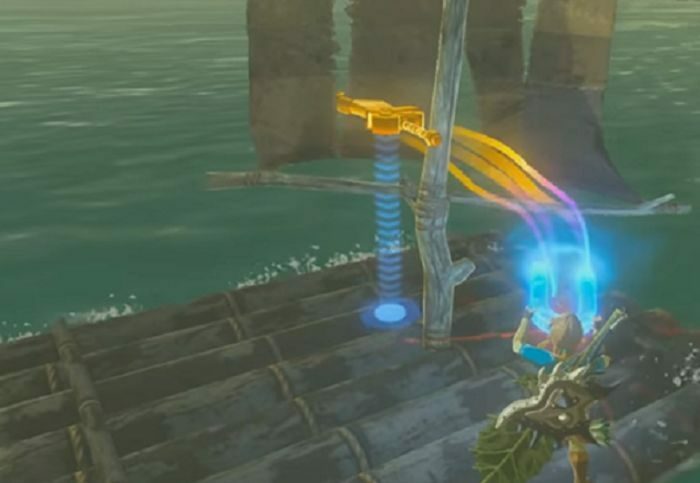 This section covers an exploit that allows you to sail a raft without using a Korok Leaf. In Breath of the Wild, a raft’s function is to travel across uncharted waters to reach another area or island. This is normally used in conjunction with a Korok Leaf to apply gust to travel. This traditional method is hampered due to manual taps and charges to navigate the large pool of water. However with the introduction of this trick, it allows sailing without the use of manually fanning the raft; and at the same time provides a more flexible speed control with a few adjustments. According to a reddit user, it is possible to sail with the raft using the Magnesis Rune. In order to do this, leave a metallic object aboard the raft with you. Harness Magnesis to lift the metallic object upwards, then shove it to the raft’s mast. The consequence is that the raft will begin to move in the direction where the metallic object is shoved against. By increasing the distance of the metallic object, it adds additional pressure to the mast. This causes the raft to sail even faster which is akin to the speed whenever the raft is fanned by a fully charged Korok Leaf.